Once upon a time there was a clan, not an ordinary clan. But, a clan of claims living in the ocean at the bottom in the sand. The festival attracted clams from the four corners of the world. They make the pearls inside their shell and they did this very well. Then one year and eerie sight! Produced by Mary Earple. Until this day all pearls were white but this one was bright purple! Most of them just backed away they feared for their own life. This purple pearl still unnamed was glowing way to bright! What is this? They all thought, surely this can’t be. A purple pearl? Call the doc! This he has to see! The doctor came and took the pearl away from Mary Earple. She missed her baby pearl so much, did not care if it was purple. The purple pearl was outcast and taken right away. Purple was the color, the pearly whites were not allowed to say! The purple pearl was placed aside and so felt all alone. Someday she thought I will be found and they will take me home. Days went by and years rolled on as the purple pearl did grow. Every day she would make a wish to make her brilliance show. And then one day it happened and it was quite by chance. Another outcast purple pearl had asked her out to dance. In time the two were married and moved across the sea. 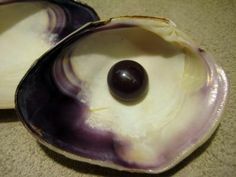 They has so many purple pearls; clams came from all around to see! Then one day a fisherman found the purple pearls. And took them from their home and traveled around the world. Soon they were all treasured and their brilliance showed. Now you know the purple pearl and how the story goes.